At first glance mods seem to be working fine, but only time will tell how this update will effect each mod individually. Again, no issues reported so-far but feel free to comment below if you have general thoughts or concerns about this patch. Authors of mods that have specific issues should be contacted directly or via their file comments. In response to post #34580070. #34593695 is also a reply to the same post. Either that, or the last patch changed how "gradients" work (which seems unlikely, as I have other mods installed that edit gradients...). Eruadur wrote: So in short: you ff-ed up and you blame Bethesda for it. Your modding is not officially supported, therefore whatever results it might incur are your fault only, as well as your own responsibility. You are continuing to avoid my main question - how could a game be SO UNSTABLE that a *TEXTURE* would cause instant CTD's without even RENDERING said texture...? >Because Bethesda game, and because Gamebryo. This is Creation Engine. Look it up on the wikipedia if you wana talk about it. I doubt anyone that read about it or worked with Skyrim/FO4 CE to make mods would make this claim that it's Gamebyro. I just *KNEW* someone would call me out for calling it "Gamebryo". It doesn't matter how many changes they made - the "Creation Engine" is still build ON TOP OF the Gamebryo Engine, and suffers from MANY of the same limitations and restrictions said engine possesses. Your gif of Todd Howard should be replaced by every Bethsoft fan who can't let go of whining about Gamebryo. It's Bethesda's engine, who cares what it's called. The game runs stable for many people, myself included. If you installed some crap incorrectly it's your fault. No amount of whining is going to change that. You wouldn't open up your PC chassis, pluck a single capacitor from your motherboard and then complain about how unstable your mobo is that it can't even handle losing a single little piece. Still having CTD issues, at completely random times and locations. deleted ini's and restarted game to create new. 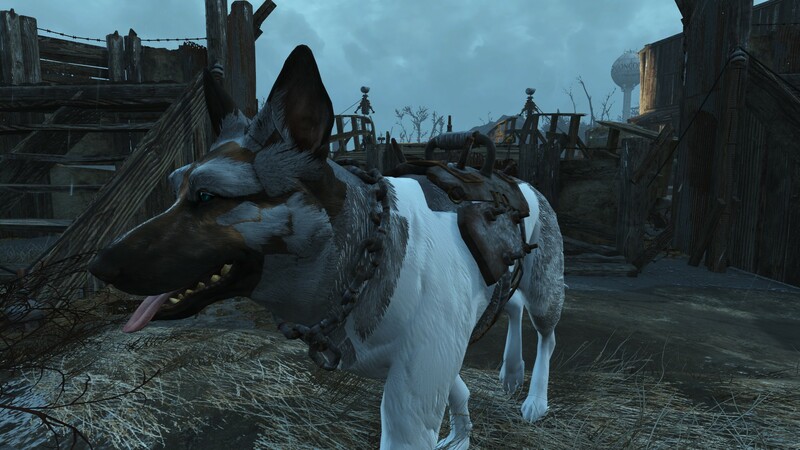 Interestingly, doing this didn't create a fallout4custom.ini, only the fallout4.ini and fallout4prefs.ini. Incidentally, running the game without the fallout4custom.ini in the folder allowed for a stable gaming session for 2 or 3 hours, which is a vast amount more than the approx. 15 to 20 mins I normally get before CTD. Obviously this would prevent me from using other mods but it's interesting it provided improved stability. You shouldn't be having that many CTDs. Sounds like you have some bad mod installs. Texture mods will generally not cause CTDs like that. I would recommend a fresh install of the game after backing up your save files. im having a problem where any mod weapon i download and install is invisible in the game happens with modded armor too.however mods that alter vanilla weapons seem to not be invisible in game i tried unistalling the modded weapons/armor and reinstalling but the issue persists i looked online and no one else seems to have the same problem as this? does anyone know how to fix it? Sounds like you probably have installed the mod's files in the wrong folder. Check your file paths are correct. Anyways this isn't the mod support forum so it's not the place to post requests for support. Suddenly new beta patch which adds some new items here and there. Wonder if they're new items or just copies already in the game files. @cassellcorey: Your post and the replies are now gone - this is NOT the place and you are guilty of an attempt to hijack a topic that has nothing to do with your problem - We actually have separate forums for each of the over 230 games we support. Post your problem in the proper forum - make a new topic of your very own ( no extra charge for that) and give some information - "It's broke" is totally useless for trying to get help. Or, you could read the stickies and FAQs for whatever game you are using As that is one of many things you didn't tell us, Here is a generic 'How to ask for help' post from my own blog. So in short: you ff-ed up and you blame Bethesda for it. I don't see how you ffing up a texture is Bethesda's fault, that's like me making a mod wrong, and causing me to CTD then cry to Bethesda claiming how their engine is bad because my mod wasn't working. If I were you; I'd just try and find the problem in YOUR textures, which YOU added, updates can cause breaks, and mature people would fix them to work with the new engine update, instead of crying to Bethesda about why your mod 'works' even though it clearly doesn't, then flaming Bethesda about their engine for it. Actually, if the mod was working just fine pre-patch it was very likely something the devs changed. But Bethesda is the publisher, not the the dev. So yea, it's not 'their' fault. But the devs likely changed a few things that might break some mods. That's what happens you get patches. "Fixed an issue where the player could no longer get Preston as a companion"
I am pretty sure that was a feature. In response to post #34615300. #34623920 is also a reply to the same post. KimberJ wrote: This is Creation Engine. Look it up on the wikipedia if you wana talk about it. I doubt anyone that read about it or worked with Skyrim/FO4 CE to make mods would make this claim that it's Gamebyro. And unity5 is build on unity4 which is built on unity3 etc. All engines go through this. An engine that comes out and never gets newer versions means it's a bad engine. I'll take the gamebryo that allows me this freedom of modding and open world over your shiny engines that can only function inside limited, tiny rooms. Anyway, whatever you did to your game is your doing. Beth can change the damn textures as they please, and you'll have to deal with it.